"As always, absolutely perfect in every way. What a difference from the old ones, very nice material and the machining is great, the fit with the bushes is also as it should be." 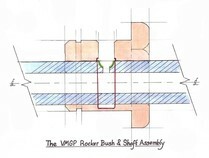 Vintage MG Parts are now able to offer customers rocker shafts of exceptional high grade material specification and these are available to enthusiasts using our special VMGP rocker finger bushes. Everything is made here in North Yorkshire and is exclusive to VMGP. We have improved the standard MMM arrangement and you may wish to read on for more details. Why Fit VMGP Rocker Shafts? We are using certificated AISI4250 Condition 'N' Drawn and stress relieved Chrome Moly tubing with a tensile strength of 120,000 psi. This tubing is to the original MG factory gauge and possibly over-spec'd, although is anything too good for our cars? The material is imported from the USA and is Certificated, being manufactured primarily for the aviation industry and we can even tell you the date it was drawn! We use super-cobalt drills as nothing else will touch these shafts. Our chosen diameter for the milled cup perfectly matches up with the oil delivery hole in the bush. This feature is highlighted with a green outline in the image below. There seemed to be no obvious benefit in enlarging to the full K /L size cup. For the J type shafts particularly, we have noted that new replacement shafts have one tube with oil delivery holes facing inwards to the cam and the other tube with the holes facing outwards. We have made two jigs so both sets of holes face inwards, i.e. the VMGP shafts are handed. We have noted that no parts reproduction company has reproduced rocker shafts for the K and L models in terms of the correct relative delivery hole positions. The spacings of the lobes on the standard N camshaft are marginally different to the L & K camshafts, as were the oil delivery hole drillings on the shafts but until now, enthusiasts have had to make do with what is available, i.e. 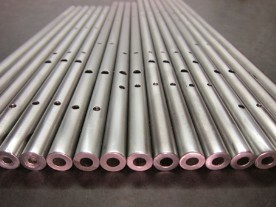 N Type shafts. We have the correct jigs to supply. However, if using our original L / K shafts then check the relative cam lobe distances first on any new supply of camshafts as there may be some manufacturing complacency in using N Type lobe spacings. This is something we have not been able to check. It is best to have oil delivery holes and cam lobes perfectly aligned. Enthusiasts now have the choice in using the correct shafts for the correct standard factory cam. All shafts are completely rodded through to debur, secondary drilled and re-inspected ready for immediate use. We have jigged up for most models and we make these to order although as mentioned earlier, we can only offer shafts to those customers who are using our bushes. We can also supply to any customers who have previously purchased our rocker bushes and wish to use our shafts. We also supply rocker finger bushes, rocker shaft intermediate support castings plus the N Type cylinder head and head gaskets.